Talents for shaman swap around depending on the legendaries you are currently using. All these talent setups are made with raiding in mind. Windsong: Personally never used this talent. It does have its place in short burst windows where the effect is strong, Gul'dan empowered eyes for example. Hot hand: Very strong with Akainu's Absolute Justice . Landslide : A Strong basic talent. Maintain the buff with 100% uptime. Will be used in almost all situations were Hot hand is not used. Rainfall: It actually does decent healing. However, it's bad on movement intense fights and burst heavy healing fights. If the raid stands still and takes consistent dmg (Thok from SoO for example), this is a GREAT talent. Currently in Legion there is not a single fight were I took it. Windrush Totem: Nice raid utility, your standard talent to take. It's slightly worse than Guardian Druid roar but more flexible. Has a long range so can be placed in ranged camps while Druids take care of melee. Feral lunge: If there is no raid movement or healing needed take this. For personal movement this is the best talent. Lightning Surge Totem: Most commonly used, decent stun. Normally always take this. Nicely used on fights like Spellblade, Botanist and Gul'dan. Earthgrab Totem: Unless there is a fight were adds can only be slowed and not stunned take this. However, there are likely to be better/passive slows out anyway. Voodoo Totem: Same situation as above, not used unless a mass CC tactic is happening. So far not used yet during Legion. Lightning Shield: Never used it. Doesn't seem very interactive. Kind of hoping it stays weak because it's the least fun of all talents. Ancestral Swiftness: Currently the most used talent. 6% haste is HUGE and still out values Hailstorm when bracers are not in play. However both are close. Hailstorm: Required when using Akainu's Absolute Justices. It's close to swiftness but slightly behind. 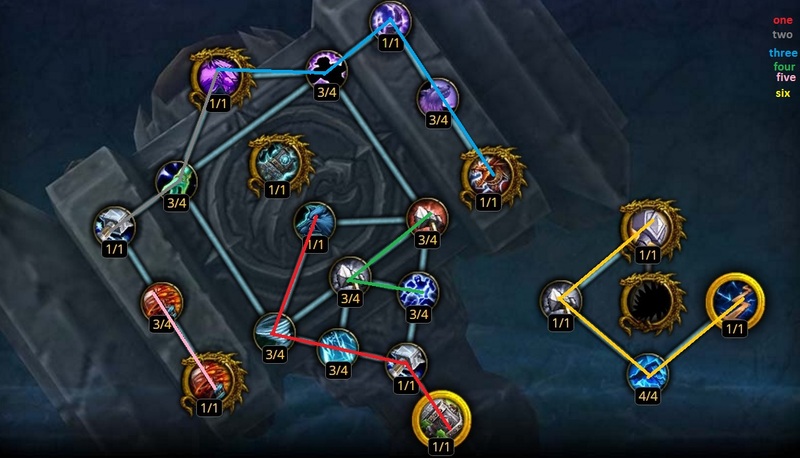 Tempest: A strong talent, however, now with the change in 7.2.5 it's not the only option. Overcharge: A strong talent. It does not feel as bad as before anymore. On fights with a lot of moving and downtime this will pull ahead. Also this is your 100% choice when using the new Soul of the Farseer. Empowered Stormlash: Never used this talent, it's one of the more boring and currently weaker talents. Don't spec this. Crashing Storm: Most standard choice, especially with 4p. Fury of Air: Just a weaker and harder version of Crashing Storm. Don't have a fight were I would personally use this. Sundering: Burst aoe, however it's not strong enough to be used in many situations. It can be used but only smartly. Ascendance: With the new rework Ascendance is quite a bit stronger. It still has the RNG factor but heavily reduced. This will be your baseline, the most used talent. Boulderfist: The new lvl 100 talent. It's currently too weak to use. Also does not really have its place since with the current haste levels we don't need the recharge timer. Don't spec this. Earthen Spike: Now is finally a strong talent. It's amazing for on point burst. When using the legendary hands this talent gains more value then Ascendance. Lines up well with our artifact ability for a strong burst. Doomhammer provides us with Doom Winds, a 1 min cd that gives all our auto attacks Windfury and the Windfury dmg is increased. This means outside of the burst dmg it also gives a lot of Maelstrom to play around with. This ability becomes a lot better with a trait I'll be talking about later. After filling out the Lashing Flames golden trait, simply start making the strongest traits 4/4. Please note these ilvls are WEAPON ilvls not Relic ilvls. Weapons of the Elements: 2.0 ilvl. Gathering Storm: Gains value in AOE but should not be your main priority.